Cape Henry is an extra desirable area next to the Lesner Bridge and the Lynnhaven Inlet. Nightlife is excellent! There are some very popular restaurants and bars here. Living in this area is considered by many to be a status symbol. There are areas of beach here and plenty of possibilities in a boat. You might be driving a while to reach an Interstate, but the roads on the way are typically 45 mph. Shopping s great! There is Lynnhaven Colony Shoppes, Sunstates Shopping Center, Great Neck Plaza Shopping Center, Seashore Shoppes and Cape Henry Plaza. Nearby neighborhoods are Lynnhaven, Cape Story By The Sea and Estates On The Lynnhaven. The Cape Henry area is in the Virginia Beach School district, Frank W. Cox. 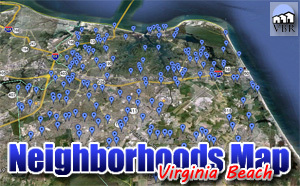 We have a page with all the homes for sale in Cape Henry. Click on this button to see everything currently listed there. When you find a home you would like to see, please let me know! Call (757)589-1237 and I will arrange a showing! Or, on the property, complete the Find Out More form and click submit. I will get information to you right away!